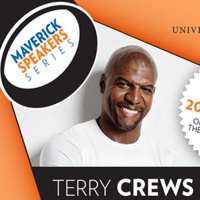 Terry Crews is perhaps best known for his action and comedy roles in an impressive body of film and television work, including The Expendables film franchise, Golden Globe award-winning comedy series Brooklyn Nine-Nine, and the wildly popular Old Spice commercials. His other films include Idiocracy, White Chicks, and The Magnificent Six. The three-time People magazine “Sexiest Man Alive” star is also a lifelong artist. His first big break after high school was an art scholarship to the prestigious Interlochen Center for the Arts in Michigan. He went on to play football for Western Michigan University and later played several years in the NFL before returning to his talents in the performing arts. His 2014 book, Manhood, received widespread critical acclaim. I loved it. It was very inspirational, I am appreciative that I got the opportunity to see him in person and hear him pour out his heart with wisdom for us, the younger generations. He mentioned the difference we all forget between being sorry and accountable, toxic masculinity, the me too movement, and how he grew up (his neighborhood as a whole, the people in his neighborhood, his family, and his struggles). It was great to see someone successful be sooooo humble. It’s an example for all of us.